Playing music together is experiencing together! Samba is fun for everybody at any time! 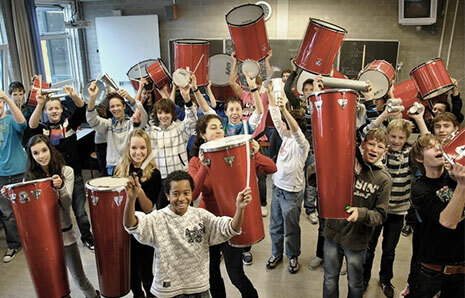 You want to start a Samba group at your school or music school and don´t quite know how to start it? We are happy to help and we have some great ideas! For Samba Reggae you need different instruments than for playing Rio Samba. The students´ age is an important factor concerning the sizes and weight of the instruments. We will help you to put together the package you want with the right instruments and accessories that suits your budget and your creative ideas. We support you with our experience and knowledge about Brazilian percussion instruments and drumming with kids in groups. We think, that especially when working with youngsters, individual solutions are extremely important. Samba and percussion is not only really fun but is also educational and an orchestral experience of a different kind. A different musical education, especially teenagers need to experience a real sense of achievement in groups. Another fun-factor is that you can keep developing your Samba band in any direction, with harmonies or even more percussion players, there are no limits and each player can extend his musical skills. Brazil is the homebase of Samba, even small kids play in the Samba schools together with people of every age. A Samba school in Brazil has a very strong social character. Not least because of associating it to a strong feeling of togetherness, it is so popular all over Europe. All Samba groups´ framework is to pass on the joy of playing music toghether to kids and adolescents, to encourage musicality und integrate physical activity, as for while drumming you can absolutely dance to your own music - if you want! It´s well worth to invest in a few thoughts in planning so that the project becomes a success and how to establish such a project over a longer term. With our support and know-how your project is sure to become a great success! KALANGO offers a wide range of brands, so we can easily find tailor-made solutions for individual needs. Give us a call or write us an email, take advantage of our knowledge about Brazilian drums and percussion music and the right instruments. Ask us about discounts for schools and music schools! We are happy to send you a personal offer!